We are becoming increasingly older: many of the children born today will one day be able to blow out a hundred candles. The challenge we now face, is to ensure that everyone also gains healthy years. Many elderly people have chronic health problems – such as diabetes or rheumatism - thus reducing their quality of life and increasing healthcare costs. In the Northern Netherlands, doctors, healthcare providers, entrepreneurs, civil servants, managers, researchers and insurance companies have worked together intensively for years in diverse networks and on various testing grounds. Northern healthcare innovations must ensure that the population grows healthily and actively and that healthcare remains affordable and accessible to everyone. These insights are not only interesting for the region, but also for the rest of the Netherlands and further afield. The European Commission has therefore also designated the Northern Netherlands as a European model region for Active and Healthy Ageing. To ensure that everyone remains healthy and active for longer, we must not only cure, but also prevent people from becoming ill in the first place. With this emphasis on prevention, health is no longer just a medical theme, but also, for example, about behaviour: how can we stimulate healthy food choices? Or about spatial planning: can the layout of a neighbourhood help stimulate residents to exercise more? In the North, scientists from very different disciplines therefore work closely with social partners, for instance at the Aletta Jacobs School of Public Health (AJSPH). A good example of such a collaboration is the Groningen district of Selwerd. The district is a testing ground where entrepreneurs, healthcare organisations, schools, housing corporations and residents together with doctors, behavioural scientists, economists and other researchers look for ways to keep residents healthy and active for longer. The district is to become an example to also increase the liveability and health of the residents in other neighbourhoods. Read the online version of the FD article here. To improve healthcare and keep it affordable at the same time, innovation is essential. Many smart ideas are both conceived and carried out in the North. For example, the test for cervical cancer by CC Diagnostics in Groningen. This test promises to give less misdiagnoses of cervical cancer than the current screening method and, because it can be performed at home, the test is also much cheaper. Another example is the pilot project that uses 5G, a fast mobile communication technology, to get a better picture of where healthcare equipment such as beds, wheelchairs and hoists are located. By linking this information to the demand at different care locations, vast improvements can be made to the logistics, making care more patient-friendly and cheaper. 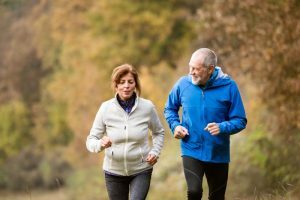 Which techniques can ensure that older people remain active for longer and are less dependent on healthcare professionals? Focusing on this question is the research centre SPRINT (Smart Prevention, Rehabilitation & INtervention Technologies for improved mobility). For example, within SPRINT a prosthetic leg is being developed that will make it easier to maintain balance but also new drive mechanisms for wheelchairs. Entrepreneurs, thinkers and decision-makers are working closely together on a healthier society in the North. 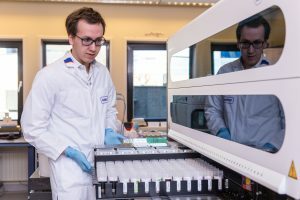 The University Medical Center Groningen (UMCG), the University of Groningen and the Hanze University of Applied Sciences are at the international top when it comes to education and fundamental and clinical research on healthy ageing. These institutions work together in different networks with progressive entrepreneurs and healthcare institutions as well as various idea-contributing local authorities in the Northern Netherlands. For example, in the Healthy Ageing Network Northern Netherlands (HANNN), the ‘healthiest coalition of the Netherlands’, in which the parties collectively pursue an environment that stimulates health. Or the Health Hub Roden, in which entrepreneurs, knowledge institutions and local authorities stimulate innovation at the cutting edge of medical technology and Healthy Ageing.